Master Pizza Makers since first being established in 1965, PizzaExpress have always taken great pride in crafting sumptuous new recipes. Because they know you share their passion for delicious pizza, this season they’re offering up big flavours, fit to satisfy all cravings. Indulge yourself in their winter specials comfort range while it's still here. With warming dishes like the smoky, spicy pulled beef Barbacoa pizza, it's a real pick me up during the cold and gloomy months! Head to one of their PizzaExpress restaurants...You know you want to. 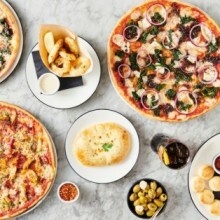 Save up to 6% with PizzaExpress gift card. PizzaExpress is the best place for quick, delicious Italian flavours, at affordable prices.